Boricuas in Gotham is one of three book design projects (including interior layout and indexing) done for Markus Wiener Publishers, Princeton NJ. Available for order on the publisher’s website (http://www.markuswiener.com) and on various online retail stores including (http://www.amazon.com) and (http://www.barnesandnoble.com). This new and very important collection of essays reinterprets and updates the history of New York’s Puerto Rican community and its leaders from the beginnings of the great migration in the 1940s to the present time. The collection also honors the memory of the late Dr. Antonia Pantoja, who was perhaps the community’s most important and influential activist and institution builder during this period. The book is organized in chronological order and includes chapters by noted historians, sociologists, and political scientists, such as Virginia Sánchez Korrol, Ana Celia Zentella, José Cruz, Francisco Rivera Batiz, and Gabriel Haslip-Viera. These chapters focus on issues of culture, demography, language, economic status, politics, and community organization. 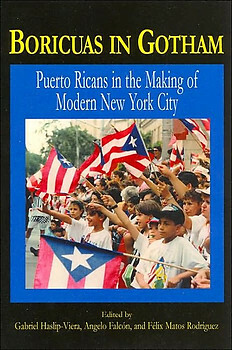 Eminently useful in college-level courses that deal with Latinos and other ethnic groups in U.S. society, the book ends with essays by Angelo Falcón and Clara E. Rodríguez that assess the legacy, current status, and future prospects of the Puerto Rican community in New York. Félix V. Matos-Rodríguez, Hunter College, is the author of "Women in San Juan: 1820-1868." Angelo Falcón, Puerto Rican Legal Defense and Education Fund, is the author of numerous articles on Puerto Rican/Latino politics. Gabriel Haslip-Viera, City College, CUNY, is the editor of "Taíno Revival: Critical Perspectives on Puerto Rican Identity and Cultural Politics."